We have to our name a unique line-up of touch up paints such as the automotive touch-up paints, appliance touch-up paints, quick drying touch-up paints, etc., that are an excellent and convenient way of performing the jobs of on-site painting and touch up jobs. Additionally, our line-up of paints comes available in a large assortment of colors such as White, Red, Black, Blue, Green, Orange, Yellow and Grey. 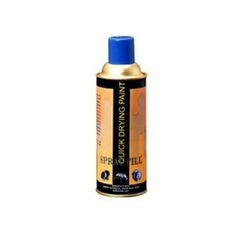 We offer an exotic range of Touch up Spray Paint that is manufactured with high-quality raw materials with certain standards. These are available in various industrial specifications & colors and are widely demanded due to salient features like corrosion resistant, halogen-free, easy to use and nontoxic. These are offered at reasonable prices. Used in plants, home appliances, refrigerators, air – conditioners, washing machines, machinery manufacturer, switch boards and control panels manufacture, ship buildings and ship repairs. Architectural aluminum, powder coating, painting signboards, exhibition panels and advertising hoarding. Used especially in magnetic particle inspection. Color Contents Product Code Package Qty.